Roberts (shoulder) finished the 2018 season with nine catches for 100 yards and three touchdowns on 20 targets across eight games. The Lions placed Roberts (shoulder) on injured reserve Tuesday. 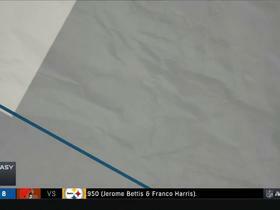 Roberts was targeted twice but did not record a reception during Sunday's 17-3 victory over Arizona. Analysis: Both Roberts and Luke Willson took a backseat to Levine Toilolo, who logged 80 percent of the offensive snaps and was the only tight end on the team to catch a pass. Roberts has now logged just five receptions for 37 yards over his last five games since busting out against Miami for 48 yards and two scores in Week 7. Roberts (shoulder) is listed as active Sunday at Arizona, Kyle Meinke of MLive.com reports. Analysis: Since injuring his shoulder Week 10, Roberts has missed two of three games. In his sole appearance Week 12 against the Bears, he split tight end reps with Levine Toilolo and Luke Willson, catching three of his six targets for 16 yards. With the trio healthy, it'll be difficult for one of them to emerge from the pack. Roberts (shoulder) is listed as questionable for Sunday's game against the Cardinals. Analysis: Roberts sandwiched limited practices Wednesday and Friday around a full session Thursday, with his involvement throughout the week likely pointing to him suiting up Sunday. Though Luke Willson sits atop the depth chart at tight end, Roberts has been active in the passing game as a reserve, drawing 17 targets over his last five appearances. Roberts (shoulder) was a full participant in Wednesday's practice. Analysis: Roberts sat out last week's loss to the Rams due to the lingering shoulder injury but appears to be nearing a return to full health. The second-year player should suit up Sunday against the Cardinals, serving in a backup capacity behind starting tight end Luke Willson. Roberts (shoulder) is inactive for Sunday's game against the Rams. Analysis: Roberts' absence for the second time in three games leaves Levine Toilolo as the sole backup to starting tight end Luke Willson. Considering Roberts was a limited practice participant from Wednesday through Friday, he should have a decent shot at making it back for the Lions' Week 14 contest in Arizona. Roberts (shoulder) is listed as doubtful for Sunday's game against the Rams. Analysis: Roberts was a limited participant in practice throughout the week, but the Lions may have needed him to put in a full session to feel more confident about his status for this weekend. With the second-year player seemingly on track to sit out for the second time in three games, Luke Willson and Levine Toilolo may be the lone healthy tight ends available for Detroit. Roberts (shoulder) limited in Wednesday's practice. 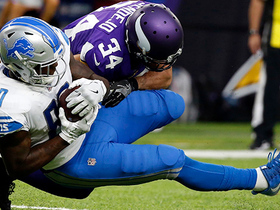 Analysis: Roberts has been a fixture on the injury report through November with the shoulder issue, but there's no indication that he suffered a setback coming out of the Lions' Thanksgiving Day loss to the Bears. The second-year tight end's ability to open the week on the practice field in any capacity bodes well for his chances of suiting up Sunday against the Rams. Roberts caught three of six targets for 16 yards during Thursday's 23-16 loss to the Bears. Roberts (shoulder) is active for Thursday's game against the Bears, Tim Twentyman of the Lions' official site reports. Analysis: Returning from a one-game absence due to a shoulder injury, Roberts will have to vie with veterans Luke Willson and Levine Toilolo for snaps at tight end. That said, the Lions are without a pair of key skill-position players in Kerryon Johnson and Marvin Jones with a pair of knee injuries, meaning Roberts will have less competition for reps near the goal line. While Roberts has been targeted just 12 times in six appearances this season, five of those looks have occurred in the red zone. 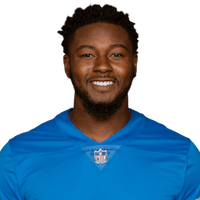 Roberts (shoulder) is listed as questionable for Thursday's game against the Bears, Tim Twentyman of the Lions' official site reports. Analysis: Listed as a limited participant each day this week, Roberts seemingly has a shot to rejoin the lineup after sitting out Sunday's 20-19 win over the Panthers. 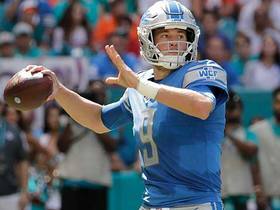 He's only seen 12 targets in six games this season, but there's potential for increased involvement with wide receiver Marvin Jones (knee) and running back Kerryon Johnson (knee) both unavailable, as the Lions may need to get creative to move the ball against a tough Chicago defense. Roberts (shoulder) was a limited participant at Tuesday's practice, Dave Birkett of the Detroit Free Press reports. Analysis: Roberts has taken a step forward after missing Sunday's game against the Panthers and not practicing last week, but he shoulder issue continues to linger. Wednesday's practice participation should provide a better idea of how the 24-year-old's shoulder is recovering ahead of Thursday's game against the Bears. Roberts (shoulder) was a limited participant in Monday's practice, Dave Birkett of the Detroit Free Press reports. Analysis: Roberts missed Sunday's loss to the Panthers due to a lingering shoulder injury, and still remains hampered by the issue. The second-year tight end faces a short week of recovery as Thursday's divisional tilt against the Bears approaches. If Roberts is unable to suit up Week 12, Luke Willson and Levine Toilolo will split snaps at the tight end position. Roberts (shoulder) is listed as out for Sunday's game against the Panthers. Analysis: Roberts was unable to practice in any capacity this week after getting hurt in the Lions' 34-22 loss to the Bears on Nov. 11. Fortunately for the Lions, they'll get Luke Willson (shoulder) back from a one-game absence this week, giving the team two healthy tight ends. Roberts (shoulder) didn't practice Thursday. Analysis: Roberts' absence was forecast when he wasn't seen at the part of Thursday's session open to the media. The second-year tight end missed out on a chance to carve out a role with starting TE Luke Willson (shoulder) sidelined Week 10 at Chicago, suffering a shoulder injury of his own during that contest. Considering Roberts hasn't made an appearance on the practice field this week, Friday's injury report could include the final word on his availability for Sunday's contest against the Panthers. Roberts (shoulder) wasn't spotted on the field for the portion of Thursday's practice that was open to the media, Tim Twentyman of the Lions' official site reports. Roberts (shoulder) was a non-participant during Wednesday's walk-through practice, Tim Twentyman of the Lions' official site reports. Analysis: Roberts was forced to exit Detroit's loss to the Bears over the weekend due to the shoulder injury. With Luke Willson also nursing a shoulder issue of his own, Levine Toilolo could be pressed into the starting lineup Sunday against the Panthers as the only healthy tight end currently on the roster. Roberts is questionable to return to Sunday's game against the Bears due to a shoulder injury, Dave Birkett of the Detroit Free Press reports. Analysis: Roberts caught one pass for nine yards before exiting Sunday's divisional matchup against the Bears with a shoulder injury. If Roberts is unable to return, Levine Toilolo will serve as Detroit's only healthy tight end. Roberts is in line for an elevated role with starting tight end Luke Willson (shoulder) inactive Sunday at Chicago, Michael Rothstein of ESPN.com reports. Analysis: It's unclear whether Roberts or Levine Toilolo will get the start in Willson's stead. With just 78 catches in 87 career games, Toilolo is unlikely to do much as a pass catcher Sunday. Meanwhile, Roberts has made his presence felt in five appearances this season, reeling in five of nine passes for 75 yards and three touchdowns. The second-year tight end will attempt to become the sixth different tight to reach the end zone against the Bears defense this season. Roberts caught one of four targets for 12 yards during Sunday's 24-9 loss to Minnesota. Roberts was targeted once but did not record a catch during Sunday's 28-14 loss to Seattle. 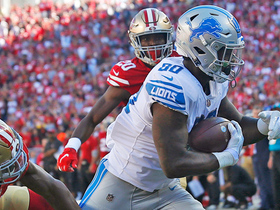 Analysis: Roberts continued to see attention near the goal line, but quarterback Matthew Stafford tried to force the ball into a tight window in the end zone, and the lone pass sent Roberts' way ultimately fell incomplete. Having only topped one target in his four appearances this season, Roberts is nothing more than a low-floor, touchdown-dependent fantasy option entering a Week 9 matchup against Minnesota. Roberts caught all three of his targets for 48 yards and two touchdowns during Sunday's 32-21 win over Miami. Roberts (knee) is active for Sunday's Week 7 tilt against the Dolphins. Analysis: The 2017 fourth-round pick will be in uniform for the first time since Week 2. Roberts' sole catch this season went for a 15-yard touchdown, and with the lack of explosive options at the position for Detroit, he likely has as much of a chance as starter Luke Willson of making an impact. However, the majority of the Detroit air attack will continue to run through the top receiver trio of Golden Tate, Marvin Jones and Kenny Golladay. Roberts (knee) is listed as questionable for Sunday's game against the Dolphins. Analysis: Roberts participated fully in practice Thursday and Friday, which may put him on track to suit up for the first time since Week 2. If cleared to play, Roberts would likely only handle limits snaps behind starting tight end Luke Willson and top backup Levine Toilolo. Roberts (knee) was a full participant in Thursday's practice, Tim Twentyman of the Lions' official site reports. 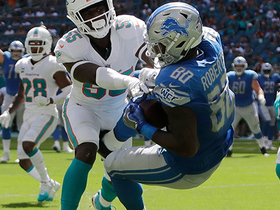 Analysis: Roberts appears to have gotten healthy during Detroit's bye week, and is trending towards suiting up for Sunday's game against the Dolphins. Expect Roberts to split the tight end workload with Luke Willson and Levine Toilolo. Roberts (knee) was a limited participant in Wednesday's practice. Analysis: Roberts did not participate in practice at all leading up to Detroit's bye week, so his limited participation is a step in the right direction. The second-year pro should be considered questionable for Sunday's game against the Dolphins, and even if Roberts suits up, he'll split tight end snaps with Luke Willson and Levine Toilolo. Roberts (knee) has been ruled out for Sunday's game against the Packers. Analysis: Roberts didn't practice in any capacity this week as he continues to work his way back from a knee injury he originally sustained in Week 2. Look for Luke Willson and Levine Toilolo to again split the workload at tight end. Roberts (knee) was not seen at the open portion of practice Thursday, Tim Twentyman of the Lions' official site reports. Analysis: Roberts has not seen the field since Week 2 against the 49ers, so this news is not an encouraging sign for his Week 5 availability. If Roberts continues to miss time, Luke Willson and Levine Toilolo could see snaps in the tight end rotation. Roberts (knee) is ruled out for Sunday's game against the Cowboys, Tim Twentyman of the Lions' official site reports. Analysis: Roberts' lack of availability is no surprise, given that the second-year tight end has not returned to practice since sitting out Week 3's win over the Patriots. As long as Roberts remains sidelined, Luke Willson, Levine Toilolo and Hakeem Vales should continue to split snaps at the tight end position. Roberts (knee) did not practice Thursday, Tim Twentyman of the Lions' official site reports. Analysis: Roberts sat out Detroit's Week 3 victory over the Patriots due to a knee injury and has not participated in practice since. The second-year tight end will need to fully participate in practice at some point this week to have any chance of suiting up against the Cowboys on Sunday. If Roberts misses any time, Luke Willson, Levine Toilolo and Hakeem Valles could be in line for increased snaps. Roberts (knee) is inactive for Sunday's game against the Patriots, Tim Twentyman of the Lions' official site reports. Analysis: Roberts mysteriously popped up on the injury report Friday due to an unspecified knee injury, which evidently is severe enough to contain the second-year Toledo product to the sideline Sunday. With Roberts out, Hakeem Valles will join Luke Willson and Levine Toilolo on the active roster, and all should have some sort of role in the offense. Roberts (knee) is considered questionable to suit up against the Patriots on Sunday. Analysis: Roberts was limited in Friday's practice due to a knee injury. It remains to be seen whether the second-year tight end will suit up in Week 3. If Roberts were to miss any time, fellow tight ends Luke Willson and Levine Toilolo would split a rotational workload. Roberts caught his only target for a 15-yard touchdown during Sunday's 30-27 loss to the 49ers. Analysis: It was a different story at tight end this week, as Luke Willson drew the start and ultimately wound up playing over 40 snaps (52 percent) while Levine Toilolo saw 22 (29 percent). Roberts, on the other hand, saw just seven snaps. The second-year player made the most of his limited action by finding a soft spot in the 49ers' red-zone coverage, but it will continue to be difficult to trust Roberts going forward until he evolves into something more than an occasional goal-line target. Roberts was not targeted in the passing game during Monday's 48-17 loss to the Jets. Analysis: Roberts drew the start but ultimately tied for last among Lions tight ends in snaps and targets. Until he becomes more involved in Detroit's passing attack, he's not someone who should be considered for fantasy purposes. Roberts secured a spot on the Lions' 53-man roster, Kyle Meinke of MLive Media Group reports. Analysis: With Luke Willson (knee) dinged up and uncertain to be ready for Week 1, Roberts could be in store for a significant offensive role from the outset of the 2018 season. However, the Lions are expected to get a number of tight ends involved on a regular basis this year, so Roberts will likely be splitting time with blocking specialist Levine Toilolo and third-year Monmouth product Hakeem Valles. Roberts isn't a lock to make the 53-man roster, Allen Park of MLive.com reports. Analysis: Roberts' poor play and injury troubles across the preseason may prove enough to endanger the 2017 fourth-rounder's position on the team. That, in conjunction with the rise of Hakeem Valles, could lead to Roberts becoming a roster cut this weekend. Roberts is struggling at training camp, Kyle Meinke of MLive.com reports. Roberts was not present for Wednesday's practice session due to a leg injury, Dave Birkett of the Detroit Free Press reports. Analysis: Roberts is considered a candidate to earn a larger role with the offense in 2018 with some rather unsavory options available at the tight end position. His campaign for playing time will hit a temporary halt following a leg injury suffered Monday, though the extent of the issue has yet to be made public. When healthy, expect Roberts to resume his pursuit of additional offensive snaps after playing 221 last season. General manager Bob Quinn recently indicated that Roberts will have an opportunity to earn a bigger role in 2018, Tim Twentyman of the Lions' official site reports. Roberts caught four of seven targets for 46 yards in 15 games during the 2017 season. Analysis: Roberts, who Detroit took in the fourth round of last year's draft, spent the majority of his rookie season as the No. 3 tight end behind Eric Ebron and Darren Fells. Although the Toledo product ultimately didn't make much of an impact on the stat sheet, he could take on a much more significant role in 2018 with Fells set to be an unrestricted free agent at the end of the league year. Roberts caught one pass for 23 yards during Sunday's 44-20 loss to the Ravens. Analysis: Roberts earned 20 of 63 snaps Sunday, compared to 31 for starter Darren Fells and 29 for Eric Ebron. His reception was just his second of the season, as the Lions primarily deploy Roberts as a blocker. The fourth-round rookie isn't an option in any fantasy format. 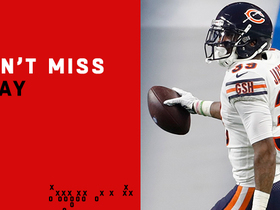 Chicago Bears cornerback Eddie Jackson reads the pass thrown by Detroit Lions quarterback Matthew Stafford and intercepts it and returns it for a touchdown. 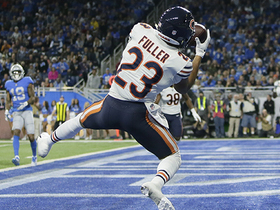 Chicago Bears cornerback Kyle Fuller intercepts the pass thrown by Detroit Lions quarterback Matthew Stafford to help seal the win in Week 11. 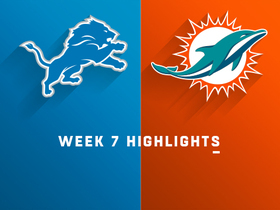 Check out highlights from the Week 7 matchup between the Detroit Lions and Miami Dolphins. Detroit Lions QB Matthew Stafford finds tight end Michael Roberts for a 4-yard touchdown catch. Detroit Lions QB Matthew Stafford connects with tight end Michael Roberts for a 29-yard catch. Detroit Lions QB Matthew Stafford finds tight end Michael Roberts for a 15-yard touchdown catch. Detroit Lions tight end Michael Roberts catches for a 15-yard touchdown late in the fourth quarter. Detroit Lions quarterback Matthew Stafford fires to tight end Michael Roberts for 23-yard gain. 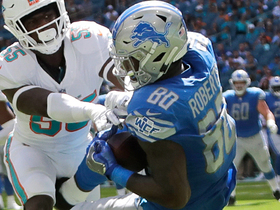 Detroit Lions tight end Michael Roberts records his first NFL reception.